Bear Photo Workshop for Brown Bears fishing for Salmon at Katmai National Park. From our private lodge deep in the heart of Alaska's premier wilderness on the shore of Lake Iliamna nestled between Katmai, Mc Neil River and Lake Clark where we will fly out each day to a different location to photograph peak of the bear fishing action. 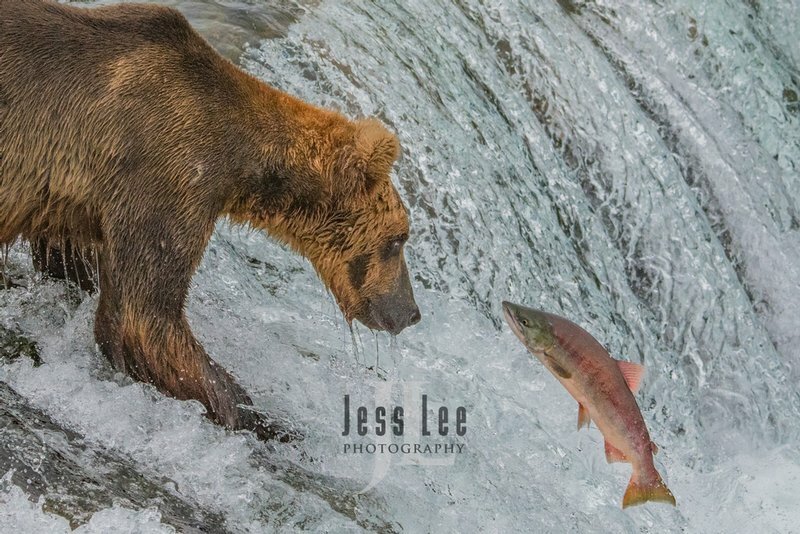 We will safely photograph Brown Bears activity fishing for salmon in the most productive locations in th world. You will be in awe of the opportunities provided in this trip. Also there will be bears conducting the rae behaviour of digging and feeding on clams. With many decades and hundreds of trips to photograph Grizzlies I can say this is the best chance to capture the primer action of Brown Bears fishing for salmon from a bears eye view. In addition we will also have an opportunity to photograph a huge remote and seldom visited walrus colony. Plan on arriving in Anchorage by June 30 and return to Anchorage the afternoon of the 7th.